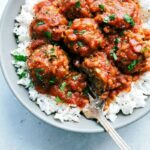 Delicious and easy porcupine meatballs that take minutes to make and cook in your crockpot. Little prep and impressive results! So far every single Valentine’s Day the husband has cooked dinner for him and I. This is a really big deal for him, because he really doesn’t cook besides the occasional freezer meal (he says those count), spaghetti + spaghetti sauce, and assembling a sandwich. Oh, he’d also be upset if I didn’t mention pouring a bowl of cereal — that definitely counts as a meal…according to him. I’ve told the story when we were dating once and he passed a gourmet meal off as his own. Later I found out that after a failed attempt, he frantically had gone over to his sister’s apartment and she made it for him. But for me, it’s totally the thought that counts. He’s always done such a great job at dinners that I decided it was my turn this year! 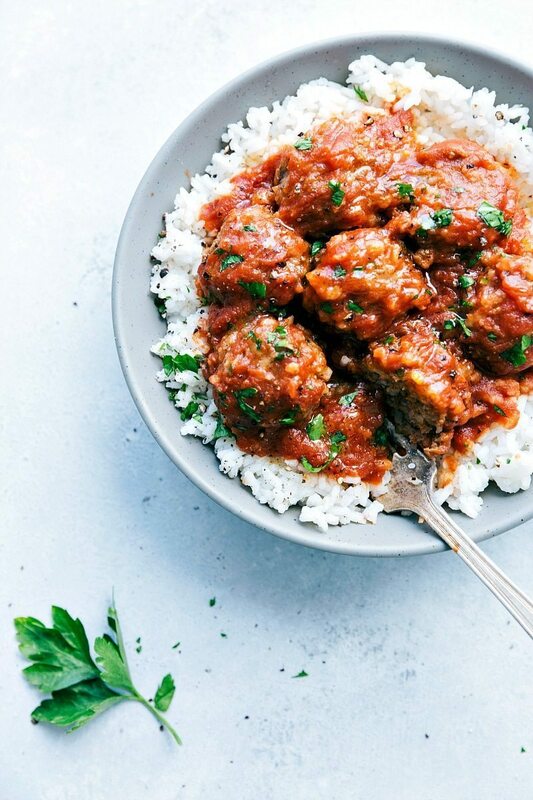 So this year for Valentine’s Day I decided on porcupine meatballs over rice mostly because first of all, I love them AND he’d never even heard of porcupine meatballs. He thought the regular spaghetti and meatballs would be good, but when I suggested porcupine meatballs instead it definitely piqued his interest. These are so simple to throw together and after slow cooking for most of the day you won’t believe how flavorful and tender these are! Enjoy! Preheat the oven to broil (550 degrees F.) Line a large tray with tin foil and set aside. Form meatballs by tightly squishing the mixture together until a tightly condensed meatball is formed (I like to use a cookie scoop for size consistency and ease). Repeat until all of the mixture is used up. The mixture should make around 20 meatballs. Place all of the formed meatballs on the tray, generously spritz with cooking spray, and then broil in the oven for 3 minutes per side (6 minutes total). This helps ensure they don't break apart in the crockpot. Remove. Spray your slow cooker with nonstick spray. Add in the water, both cans of tomato sauce, brown sugar, and Worcestershire sauce. Stir. Layer the meatballs on top (I used a 6 quart slow cooker) of the tomato mixture. 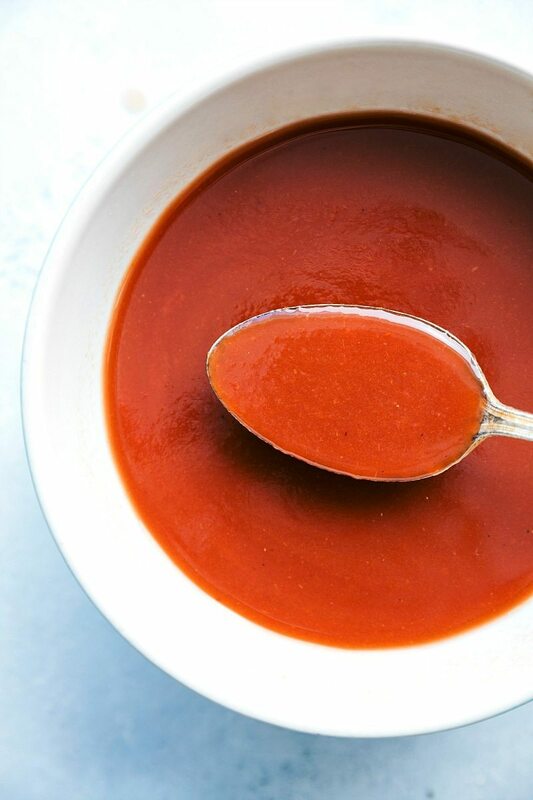 Spoon the sauce over. Cover and cook on low for 4-6 hours or high for 3-4 hours (watch carefully if you have a slow cooker that cooks a lot hotter than most). Remove from the slow cooker and serve over a bed of white rice. Garnish with salt and pepper if desired and freshly chopped parsley to taste. These look quick and easy! Love that they are done in the slow cooker! I’ve never heard of Porcupine meatballs and was very intrigued when I saw this title, haha. 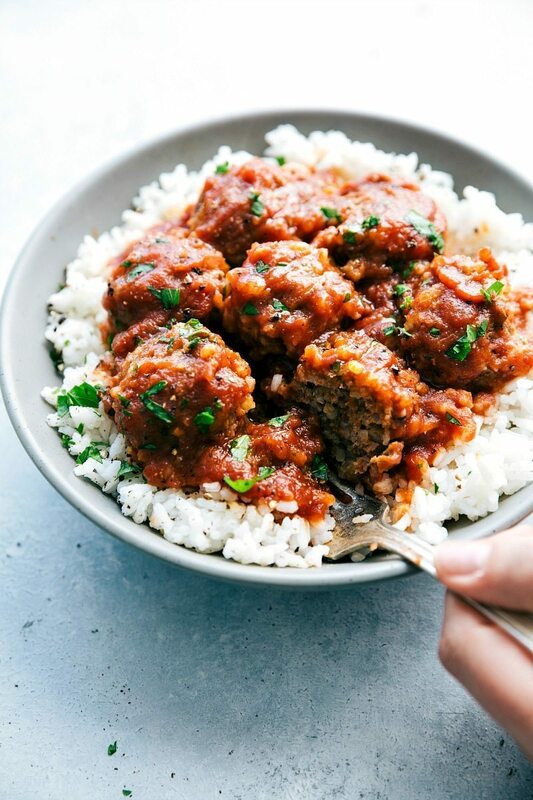 🙂 These meatballs look awesome though! 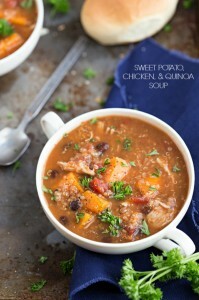 Fantastic idea to cook them in a slow cooker. Pinned! I want to eat soooo many of those meatballs RIGHT NOW! A beautiful dinner Chelsea! I’m sure Asheley would be super happy if I made this for her! She loves a good meatball! My mother made these but with a gravy style brown sauce, I had completely forgotten about them so glad to see this recipe!! 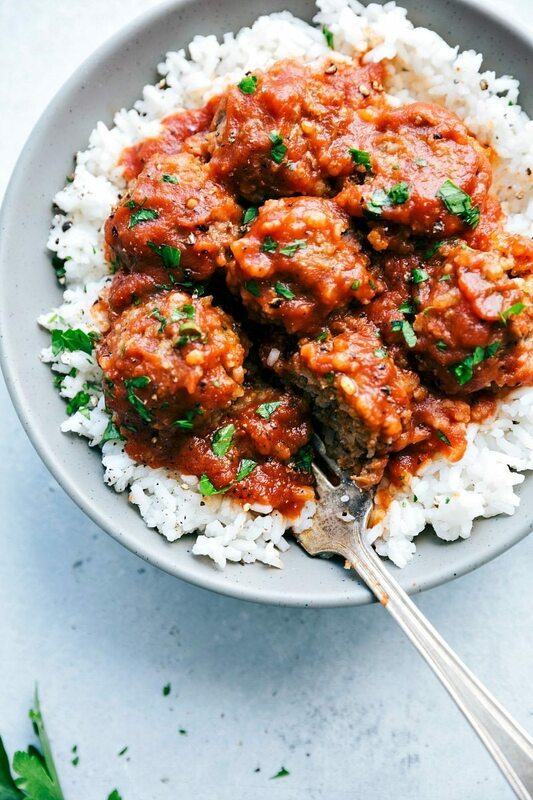 One question cause I don’t remember how my mom did it but do you use instant rice, cooked white rice or raw/uncooked white rice in the meatballs?? TIA!! I use regular uncooked white rice in these 🙂 Enjoy! Wow..Porcupine meatballs is pure Combination of taste, I like a balanced diet, a variety of protein and vitamin supplements so that they will have good health. I really like. Thx for sharing Chelsea! 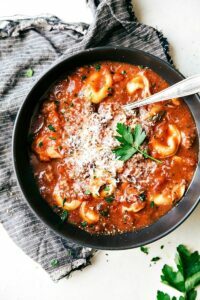 I made these with ground beef and my kids loved them. Would ground chicken work too? If I were to make this ahead and freeze for later, would I combine the meatballs and sauce together for freezing purposes? I’d keep them separate so the meatball don’t absorb too much liquid while freezing/thawing! 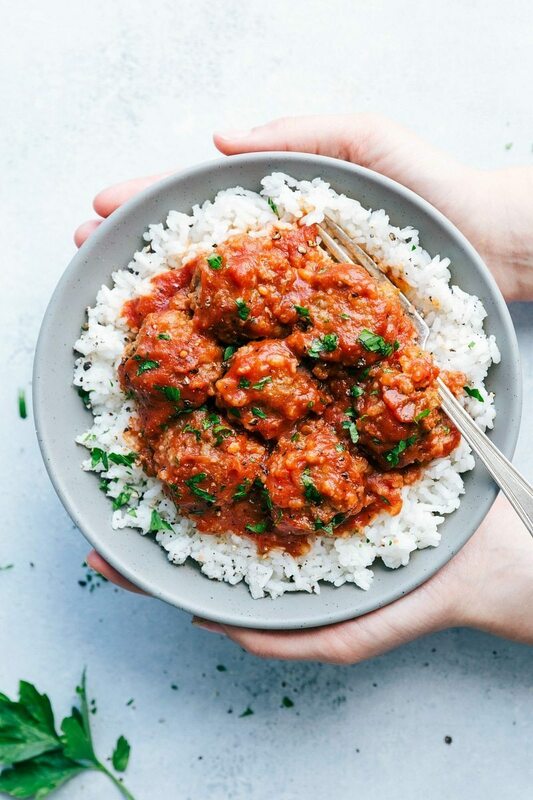 Legit speechless, that porcupine meatballs recipe looks unreal! Definitely, I will make it on the weekend for my family.